Lionfish have few natural predators in their native range, and therefore there are few native Atlantic and Caribbean species that could act as significant potential predators of lionfish. 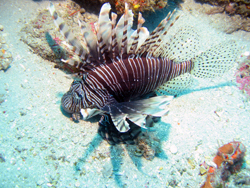 ref In the Caribbean and Atlantic, natural lionfish predators, like groupers, are overfished and are unlikely to reduce lionfish populations and their associated ecological impacts. Thirty-four species of marine fishes have been introduced into Hawaiian waters and almost 60% of these have become established. ref Of the introduced marine fishes, nearly 40% were intentionally introduced as food fish, bait fish, or aquatic weed control, ref including three species of marine fishes introduced by the State as food fish: Ta‘ape (Lutjanus kasmira/blueline snapper), toau (Lutjanus fulvus/blacktail snapper) and roi (Cephalopholis argus/peacock grouper). Some researchers and fishers suggest that the introduction of these species has resulted in a decrease in fish abundance and associated catch of other important food fish species. While studies conducted to date have failed to document a strong biological impact on native fisheries in Hawai‘i from the introduction of these species, ref there is still widespread debate on this issue. In response, The Nature Conservancy and the University of Hawai‘i are currently conducting a “roi removal” experiment where all invasive roi have been removed from a series of reefs on Hawai‘i Island and the response of the native fish community is being tracked over time (see results). Few studies have assessed the ecological and socioeconomic impacts of invasive marine fishes and studies that have been conducted focused primarily on temperate regions compared to tropical regions. ref Assessing these impacts, as opposed to simply documenting the presence, abundance, and distribution of such species is an urgent research priority. 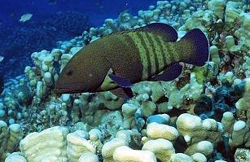 The potential ecological impacts of marine invasive fish include decreased survival of native reef animals via predation and competition, reduced recruitment success of native coral reef fishes, and the potential to decrease abundance of ecologically important species (e.g., herbivores) that are vital to support reef resilience by preventing algae overgrowing corals. Socioeconomic impacts of marine invasive fish include costs associated with combating, controlling, and eradicating invasive species, and potential declines in fisheries for native fishes.